Are you sitting on a pile of estate jewelry that you would like to sell at some point in the near future? Depending on what you have, it could potentially be worth a lot of money. There are several steps you can take to get the biggest return possible when you sell your NYC vintage and estate jewelry, which we’ve outlined below for you. Gather as much information as you can. How much do you really know about your jewelry? The more information you can gather on each piece, the better. During a jewelry estate sale, it’s great to have original boxes, paperwork, and even stories that go along with each individual piece. If there is some interesting history behind your estate jewelry, people might be more willing to pay for it. Beware the polishes and repairs. Making sure your jewelry is in pristine condition before you buy it sounds like the right course of action, but in all reality, it is probably the worst thing you could do to its value. Bench jewelers typically have little knowledge about fixing or repairing vintage and estate jewelry. Generally, major jewelry buyers have in-house or on-demand antique experts who can handle your pieces properly. Nothing is worse than finding a nice antique that has been adulterated by poor repair work, gold solder rather than platinum or lead solder that has spread beyond the repair point. A slightly broken piece of jewelry leaves some illusion for the buyer in which he can get it repaired properly rather than trying to undo someone else’s mistake. Work with a company that can help you get the highest return. Most people don’t have the first clue about selling estate jewelry on their own. You can try to go at it alone, but it could cost you a lot of money in the long run. An NYC jewelry buyer like Frank Pollak & Sons can take a look at what you have, tell you more about it, and then make you an excellent offer. It will prevent you from having to market your jewelry and deal with potential buyers and earn you a sizable profit as well. The city is filled with diamonds in the rough, and we want to take them off your hands. 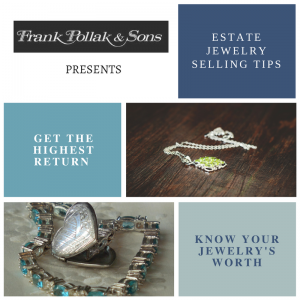 Sell your NYC vintage and estate jewelry through Frank Pollak & Sons and find out its true worth.